What Makes Bee so Special? 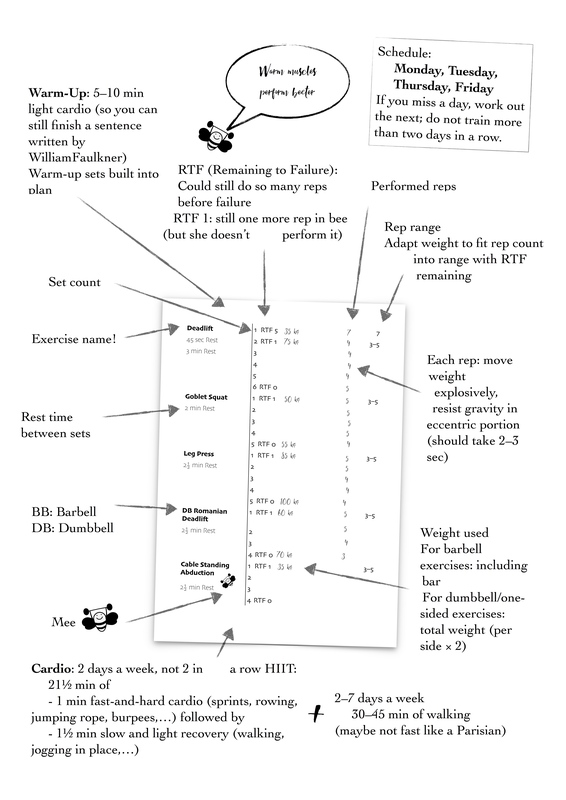 Bee puts the fun back into functional and takes the guesswork out of your workouts. But how does she do that? Exercise, rep ranges, rest time: Bee always knows what is best for you to do right now and tells you in the most functional manner. Fun lasts. Bee is not about all-serious no-jokes pain-gain. Just look at her face! We will work hard together, and laugh hard. What's fun and knowing what to do if you are doing the wrong things? With proper periodization, you train with variety and results. Bee is for you if the picture of an attractive body in the mirror excites you. Bee is for you if you want to feel the endorphin rush of moving your bones. Bee is for you if you want something satisfying to look forward to every day. This is no dream, because the endorphin rush of moving will lead to the attractive body and satisfaction. It's like bees collecting pollen will be followed by attractive and delicious pears or apples. You should have some five hours to do sports per week. We're not going to promise you it will take less, because it doesn't. Ideally, you'll have all the equipment a gym offers or free weights to throw around. We'll get you started with bare feet and a towel, too, though. You need not survive on willpower. If you do not enjoy your workouts, they'll not work long-term. So, we'll make sure you do or it's on us. Bee did not invent this. Bee's plans are based on solid science and specific studies. See some of them below and examine yourself. Bees are smart, after all, as well as hard-working ("and inventive, yes, Bee"). The thing is, Bee has done the hard work and turned the science and experience into workable plans fit for you. by Mark Rippetoe. Sober advice, clear and logical. by Brad Schoenfeld. Sums up much of the experimental underpinnings. © 2017 Maria Paz and Heinz Tschabitscher (Impressum); links to Amazon include affiliate tracking.